We are pleased to announce the release of the HPC version of FLOW-3D CAST v5.0. This release combines FLOW-3D CAST’s latest features and specialized interface for metal casters with the latest HPC advances. The HPC version of FLOW-3D CAST can be installed on an in-house cluster or can be accessed on our state-of-the-art Cloud platform. The ALL NEW FLOW-3D CAST v5.0 is a major leap forward when it comes to metal casting simulation and process modeling. 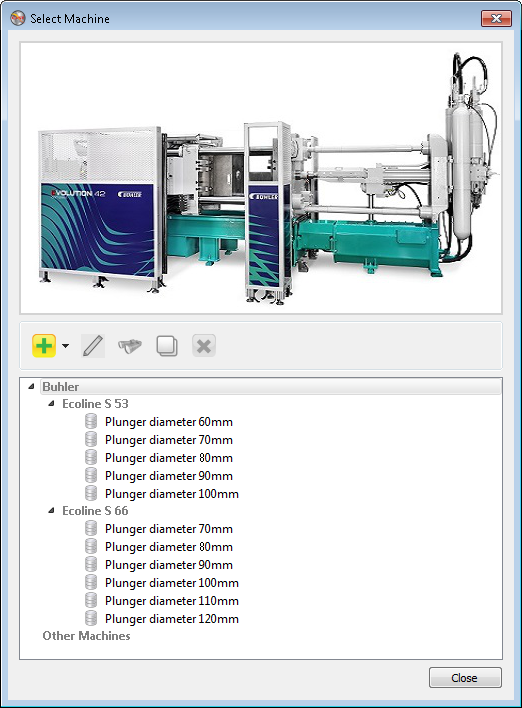 Casters will now be able to choose the process they want to simulate and the software will provide the appropriate process parameters, geometry types, and sensible defaults. This substantially simplifies the simulation setup. Additionally, FLOW-3D CAST’s robust simulation engine and new tools for predicting defects provide insights that will shorten design cycles and reduce cost. Featured developments include thermal modulus and hot spot identification output for solidification simulations, filling defect tools for identifying trapped gases and predicting venting efficiency, and faster and more robust pressure and stress solvers. The ALL NEW FLOW-3D CAST v5.0 comes in Suites that contain related processes. The Permanent Mold Suite includes process workspaces such as gravity die casting, low pressure die casting (LPDC), as well as tilt pour casting. For each process, the user interface only displays what is relevant to that particular process. The Sand Casting Suite includes processes such as gravity sand casting and low pressure sand casting (LPSC). The Lost Foam Suite includes everything in the Sand Casting Suite plus the lost foam process workspace. And the HPDC Suite includes everything relevant to high pressure die casting including thermal stresses and deformations. Within each process workspace, sub-processes like filling, solidification, and cooling are neatly-connected simulations that run one after another, modeling the complete process from start to finish, just as a metal caster would do it on the shop floor. The user can expand the process to include steps like the complete movement and filling of the ladle by dipping it into the melt pool and transferring it to the shot sleeve or pour cup. For LPDC, the process engineer can model the pressurization of the crucible and the flow of metal into the mold. With FLOW-3D CAST v5.0, the possibilities are endless. The What-You-See-Is-What-You-Need (WYSIWYN) process workspaces streamline the versatility of FLOW-3D CAST for unmatched ease of use and extraordinary solver performance and accuracy. Much of the interface has been simplified by applying the WYSIWYN design principle and asking for only the information that the user needs to provide. 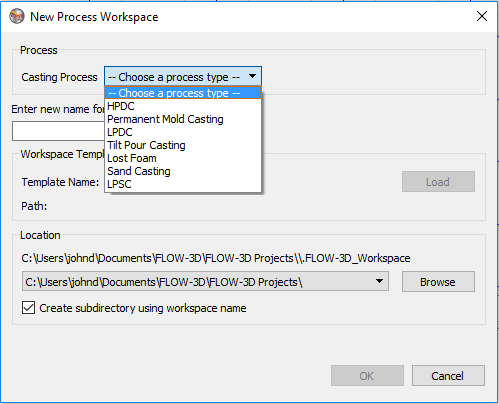 Process-driven workspaces that were introduced in FLOW-3D CAST v4.2 have been extended to include permanent mold processes such as gravity die casting, low pressure die casting and tilt pour, and sand casting processes such as gravity sand casting, low pressure sand casting and lost foam. More process workspaces including continuous casting, investment casting, sand core making, and centrifugal casting are in the works. Simulation setup is simplified by only showing the components applicable for a given process. 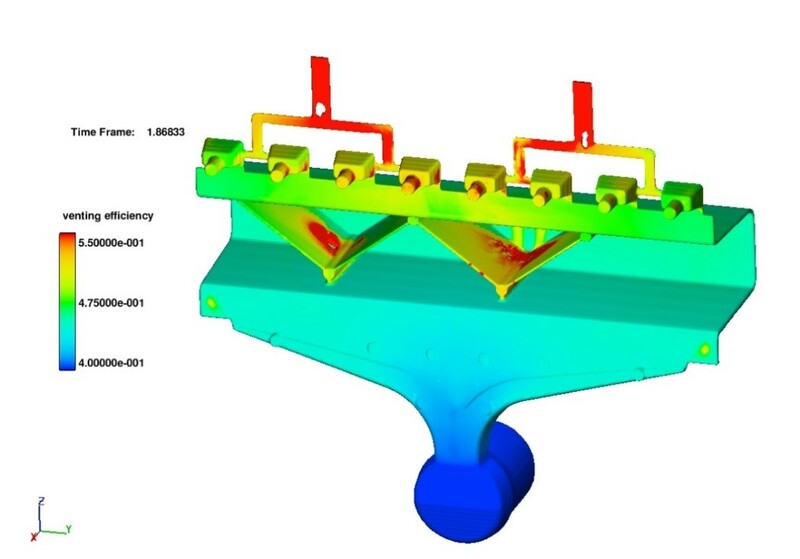 Types of casting components available in a HPDC simulation. Mold pieces available in a high pressure die casting include cover and ejector dies, sliders, and shot sleeves. Identifying filling defects caused by entrapped gas has become even easier with FLOW-3D CAST v5.0 using particles. Not only are defects much easier to identify, the computational cost of predicting them has been significantly reduced. Void particles have been introduced to represent collapsed gas regions. Previously, collapsed gas regions would disappear from the simulation if they became so compressed that they could not be resolved in the numerical mesh. Void particles behave like small bubbles and interact with the metal via drag and pressure forces. Their size changes in response to the surrounding metal pressure, and their final location at the end of filling indicate a potential defect due to air entrainment and/or oxides. Wall contact time is useful for identifying locations on the mold surface that have been exposed to metal longer than others. These regions may be more susceptible to erosion. Metal contact time reflects the amount of time metal has been in contact with solid components, e.g., sand, which may lead to microporosity because sand particles act as nucleation sites. The output for the metal contact time with individual solid components has been extended to include the contact time with all components. The calculation of the contact time is activated by selecting Wall contact time in the Output tab. 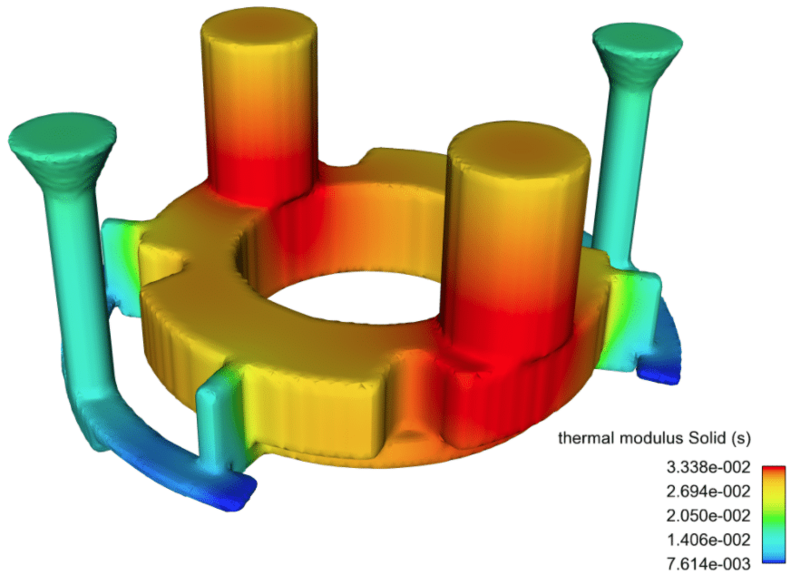 The Thermal Modulus, which is commonly used for sizing risers, is now output from solidification simulations. 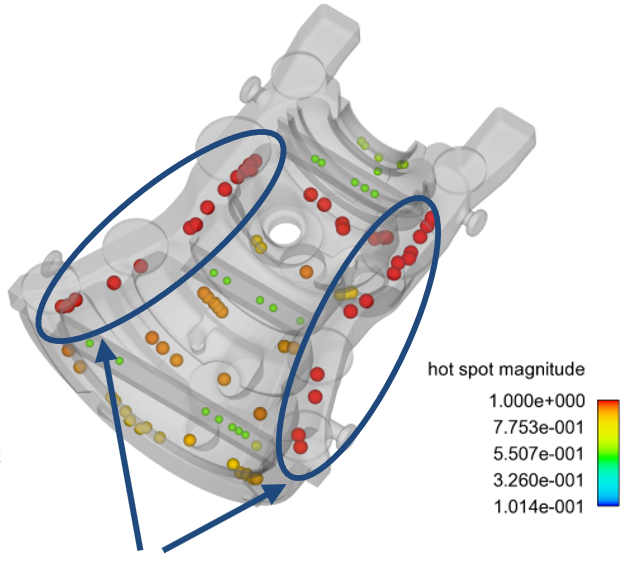 Another new output quantity, “Hot Spots” is useful in mold design for locating and sizing risers and identifying the potential for solidification-related defects. Hot spots indicate the last places to solidify. These are represented by particles and are colored by hot spot magnitude. Risers should be located where the hot spot magnitude is largest. The New Porosity Analysis Tool in FlowSight identifies porosity-related defects in real-world terms. Defects can now be identified by their net volume, largest linear extent, shape factor, and total count. Predict filling defects caused by entrapped gas using the Particle Model. Identify solidification defects with the new Thermal Modulus output. Risers will likely need to be placed on the circled regions. New defect identification tools allow users to analyze porosity. Arbitrarily-oriented 2D clips are useful for sweeping through a simulation to look for defects. Previously, the metal regions displayed on these clips extended into cells that were occupied by solid components. In FLOW-3D CAST v5.0, these clips can show metal in open space (e.g., the casting part) only by selecting the option to hide components. The intensification pressure specified in high pressure die casting simulations is now coupled to both macro- and micro-porosity models, resulting in a more realistic relationship between the formation and size of these defects and the magnitude of the pressure applied by the plunger. 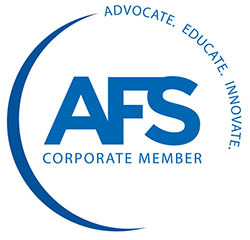 A shrinkage adjustment coefficient has been added to allow the user to fine-tune the amount and size of shrinkage porosity without the need to modify the properties of the metal. The coefficient provides a simple way of dialing up or down the amount of volumetric shrinkage during solidification. The last local gas pressure and venting efficiency have been added to the output of filling simulations to help the user identify filling defects and assist in designing the venting system in die casting. 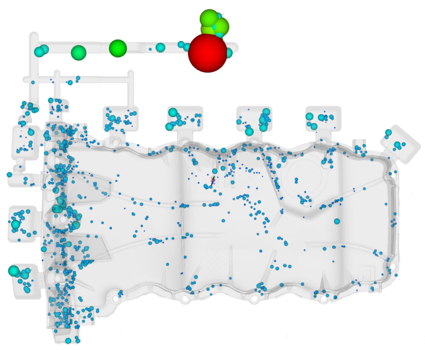 The gas pressure records the last void pressure in a cell before it is filled with metal, while the venting efficiency shows areas where placing vents would be most efficient for evacuating air from the cavity. Databases of commonly-used information in casting processes reduce setup errors and improve the simulation workflow. The HPDC machines database includes information required for performing PQ^2 analyses. 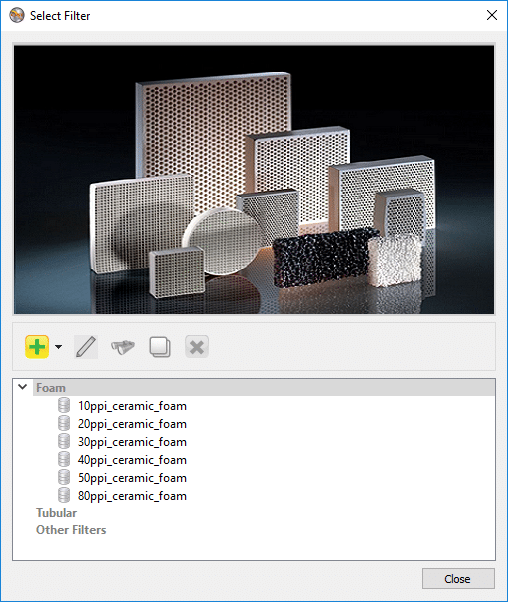 The filter database includes several common foam filters. Editors for all databases let users add additional items. The Simulation Manager now includes more plotting capabilities. Plots can be user-configured, and the configurations saved to a database for use in other simulations. 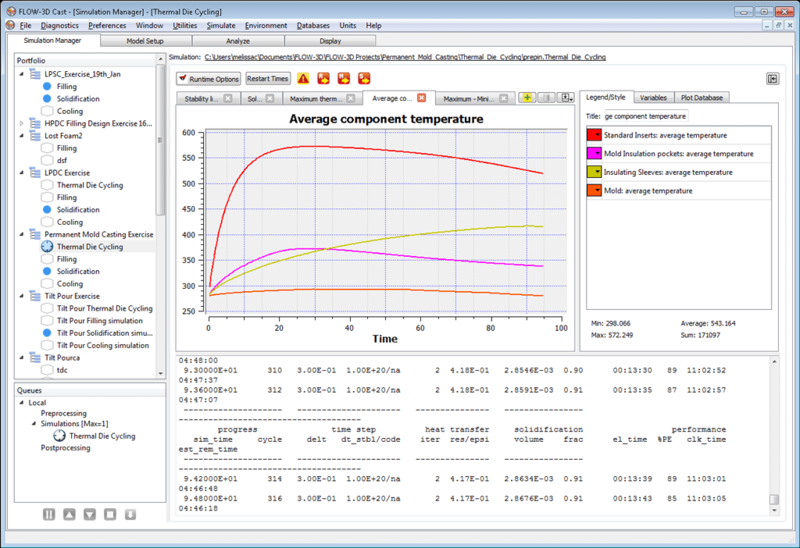 Users can specify which history-data variables to monitor on the simulation runtime graphs and add multiple variables to each graph. The conforming mesh capability has been extended so that an active computational region of an arbitrary shape can be defined. This is achieved using a new type of geometry component called meshing component that defines a region in the computational domain, spanning both open and solid volumes, which a mesh block can conform to. Mesh blocks can also be selectively conformed to either cooling channels or cavity, allowing users to choose optimum resolution for these geometric objects. Conforming meshes can now be displayed on the FAVORize tab. 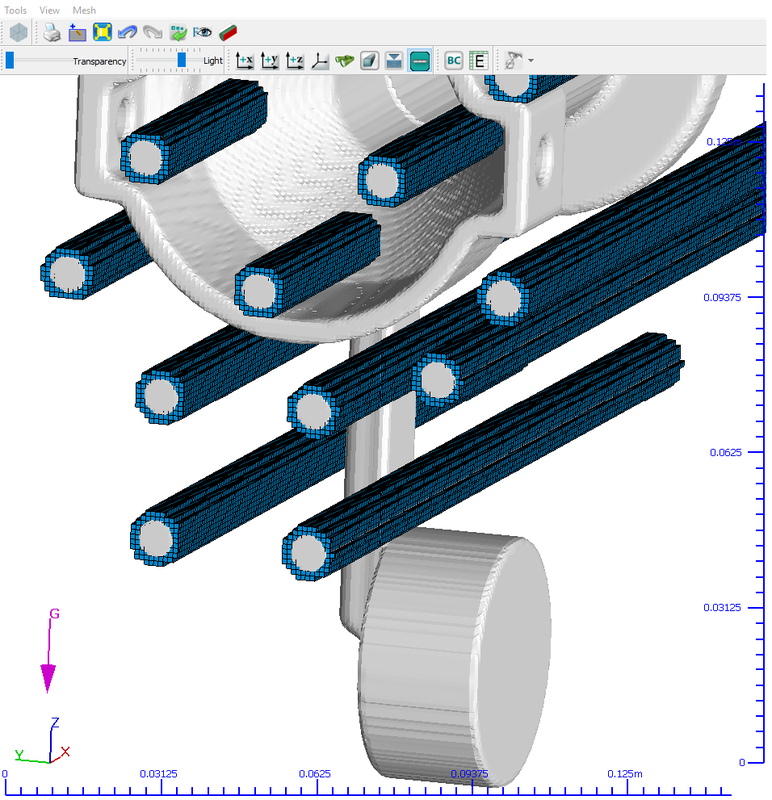 The FLOW-3D CAST v5.0 interface provides a compact view of the various geometry components in a casting simulation. 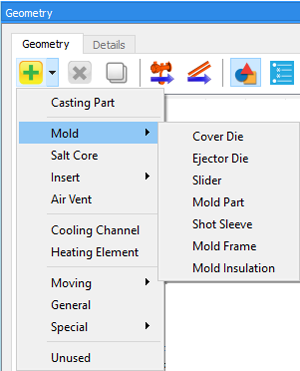 Two new Geometry Summary Views – the Component Summary View and the Cooling Channel Summary View – provide flyout, table views of the geometry components and cooling channels so that users can quickly see the important settings at a glance and make changes if necessary. The new Component Summary View showing important global settings for components. The filling/solidification stage of thermal die cycling simulations can be improved by using non-uniform cavity temperatures. 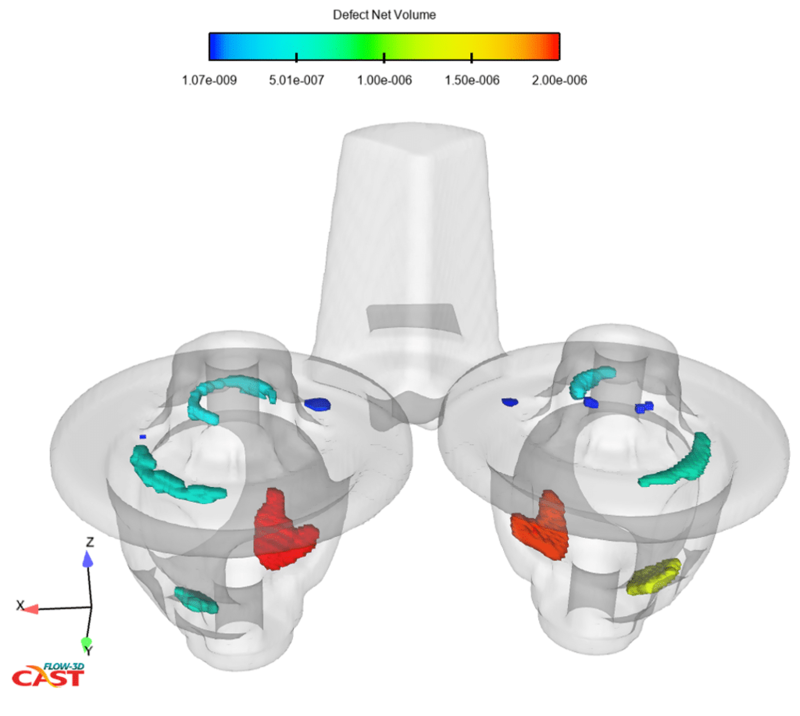 The initial temperature of the metal in the cavity can now be specified from either a filling simulation during restart or from a user-defined distribution using initial fluid regions. This feature increases the accuracy and realism of the thermal solution in die cycling compared to the uniform initial metal temperature, which is still available as an option. Additionally, restart simulations of thermal die cycling have been extended to any available restart time, instead of being limited to the beginning of a thermal cycle. 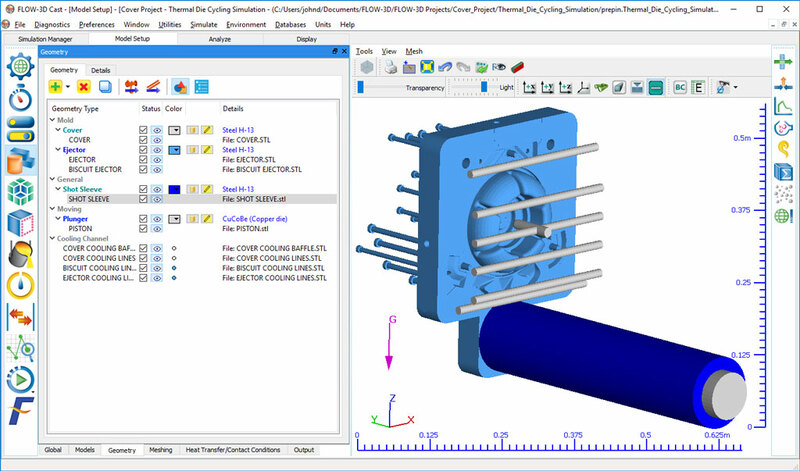 This extension brings the restart capabilities of the TDC model to the level of any other model in FLOW-3D CAST. Finally, die temperatures are now passed in full between simulations during restart, irrespective of the use of a reduced heat transfer solver in the die; i.e., the thermal penetration depth or the static temperature option. 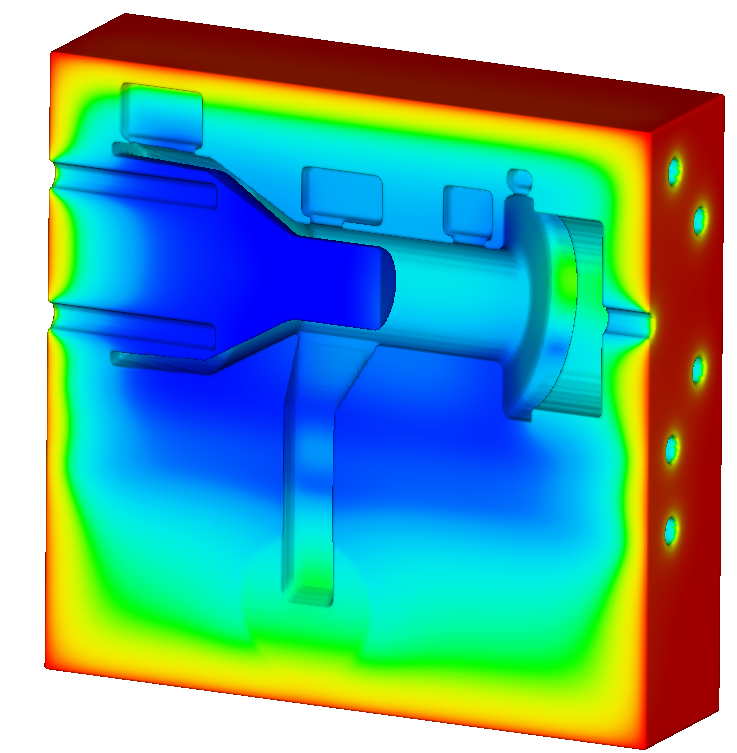 Melt temperatures in the casting cavity read from a filling simulation are applied to ejector die during filling/solidification stage of thermal die cycling simulation. Estimating the heat transfer coefficient (HTC) between the spray fluid and the die surface is a daunting task. If the values are available – either through calculation or measurement – users may directly specify those values as a function of spray distance and angle. A new feature allows the HTC to be calculated dynamically based on the flow rate of the spray fluid at a nozzle. A single adjustment coefficient provides the means to fine-tune HTC based on the amount of the spray runoff. The input variables for radiation constants, which are the product of the Stefan-Boltzmann constant and emissivity, have been replaced by only emissivity. This will make entering these numbers easier. Metal temperatures at metal inputs can now be defined as a function of time using tabular input. 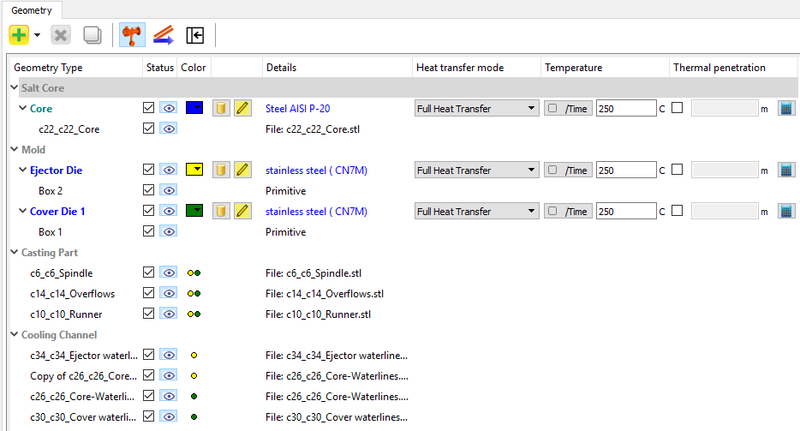 Probe-controlled heat sources: The Active Simulation Control feature has been extended to include heat sources which can now be controlled by thermocouples placed in metal and/or mold. Global conditions: Global Conditions have been added to Active Simulation Control, making it much easier to apply and manage conditions (e.g., velocity at a gate) for multiple simulation probes. The convergence criterion of the iterative GMRES solver, which is the default solver for pressure in compressible and incompressible flows, now provides a more robust solution for a wider range of applications, including transient and steady-state flows across different time and space scales. The new solver gives more consistent results across different hardware configurations, number of cores used and operating systems. The accuracy of combining multiple subcomponents and components has been improved to eliminate the occurrence of small gaps and bumps on the surface of the geometry. This is achieved by considering the relative orientation and location of the fractional volumes within each computational cell. Small gaps in the geometry often result from design tolerances and variations caused by the conversion of CAD data to STL format. These gaps can be a visual annoyance or can negatively affect the simulation results. The user can now request such gaps be closed by providing the tolerance in terms of distance below which all gaps will be closed. A similar procedure can be applied to ‘thin skin’ caused by mismatches between surfaces of different components that may appear for reasons like those for gaps. Gaps due to tolerances in CAD geometry are necessary for manufacturabilty but can cause leaking in simulations. FLOW-3D CAST v5 allows these gaps to be closed. The compiler for the solver has been upgraded to version 16.0 of the Intel® FORTRAN compiler. Users who take advantage of customizing the code should upgrade their compiler. The new compiler will work with older FLOW-3D CAST installations. The format of the FORTRAN source routines provided with installation has been changed from FORTRAN 77 fixed-form style to the free-form FORTRAN 90 convention. Among other things, this necessitated changing the source file extensions from *.F to *.F90. Customized source routines from previous FLOW-3D CAST versions will need to be converted. The speed of the finite element (FE) structural solver has been improved by optimizing the data structures used in the iterative GMRES solver for stresses and deformations. The gain in performance comes at a cost in memory usage, with the actual increase a function of the number of FE nodes. A new hybrid solver has been developed that allows the user to control the amount of extra memory needed by defining it in the input file. FLOW-3D CAST’s state-of-the-art postprocessor – FlowSight – has been upgraded from the ground up with a new, high performance graphics engine. Users will experience greatly improved graphics quality and significantly faster viewing of scenario files. FlowSight view files for batch post-processing can now be generated directly on the Meshing and Geometry panel. The Keyframing Tool gives users access to the powerful keyframing concepts such as exploded views, and view fly around. Watch this short video to see how it works. We are using FLOW-3D not only as a die cast process simulation tool but also as a general CFD software tool. 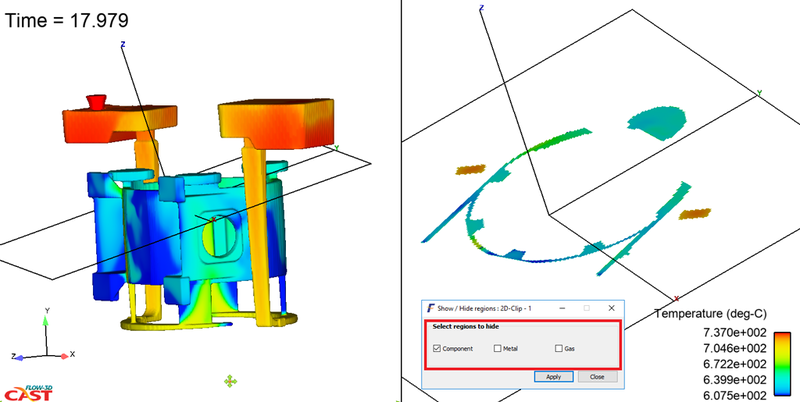 If during die cast process development, any part design changes need to be recommended to a customer, FLOW-3D allows us quickly and reliably evaluate part design changes, and present to a customer not only the proposed changes but also the effects those changes will have on the part performance.